Editor(s): Woudt, P. A.; Ribeiro, V. A. R. M.
These proceedings cover the latest results in the field of classical and recurrent novae. From 4-8 February 2013, 86 researchers from 20 different countries came to Cape Town for the fourth international conference on classical and recurrent novae, following earlier meetings in Paris (1976), Madrid (1989), and Sitges (2002). The scientific program included 5 invited reviews, 13 invited contributions, 39 contributed talks and 29 posters. It covered the full width and breath of nova research, including the latest in multi-dimensional modeling of nova outbursts, the study of gamma-ray emission from novae, thermonuclear eruptions in symbiotic systems, panchromatic observations of novae and nova shells, population studies of Galactic and extragalactic novae, and studies of the evolution of the central binary in novae. These proceedings capture the excitement of recent advances in these different areas of nova research. 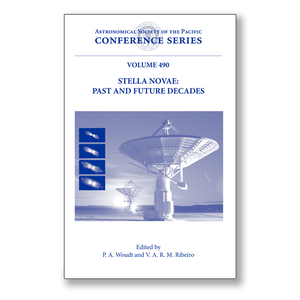 A number of individual systems are discussed in detail in these proceedings, including the recurrent nova T Pyxidis. Discussions around T Pyxidis focus on its most recent (2011) outburst, its spectroscopic evolution following the outburst, and its evolutionary trajectory. Infrared interferometric studies of novae highlight recent technological advances, revealing bipolar morphologies in a large number of nova ejecta. Radio observations of novae with SKA-like sensitivities are challenging the simple models from which we derive the ejected mass following a nova outburst, and sensitive gamma-ray observations with Fermi are revealing a large number of novae as gamma-ray sources.